When you think of patterns in art, abstract designs may pop into your head. But this doesn't mean that patterns only appear in abstract art – they can be a part of a wide variety of art styles, even including photorealism. 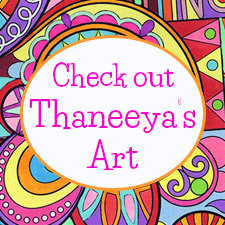 On this page I'll show you several examples of how I use patterns in my artwork, to give you ideas of how you can also incorporate patterns into your art. First: What is a pattern? In art, a pattern is a repetition of specific visual elements. 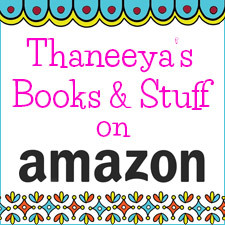 Patterns in art appear in many art forms around the world, from the detailed geometric Islamic motifs to the symmetrical patterns on woven Najavo blankets to the contemporary art designs you'll see on this page. Every culture has its own distinct set of folk patterns that appear on textiles, architecture, manuscripts, masks, and other objects. Patterns in contemporary art can add a strong element of interest to a painting, drawing or mixed media piece. In many cases, patterns form the main element of interest in a composition. Click here to learn how to draw patterns step by step! 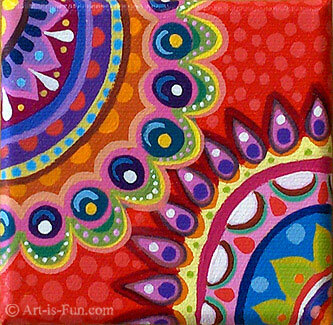 If you want to learn about several ways you can incorporate patterns into your art, read on! Let's start off by taking a look at some of my abstract art, where I use patterns a lot. In fact, pattern is one of the main visual elements used by abstract artists (along with color, form, line and texture) to create compelling compositions. The patterns are pretty obvious, right? 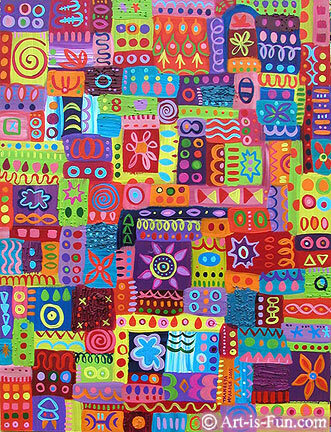 This abstract acrylic painting features several rows of patterns – some simple and some complex. 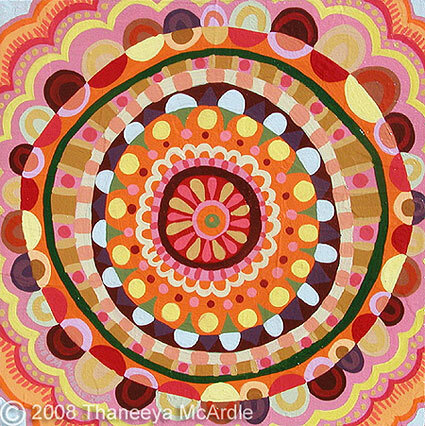 For example, the orange circles at the top are very simple compared to the elaborate multi-colored mandala patterns in the center of the painting. This is the most straightforward use of patterns in art – rows of repeating elements. Even though the formula is fairly simple, the painting is still eye-catching and compelling because of the bright colors and the variation of simple and complex patterns. Like the previous painting, this one also features rows of patterns - although they are more subtle and less detailed than the previous one. Can you identify the patterns in this painting? 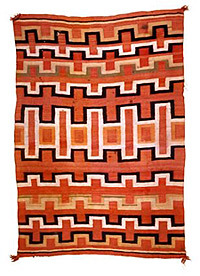 Most of these patterns are separated from other another by a line or expanse of plain color. This helps break up the space and soften the impact of the patterns, especially when contrasted with the previous painting above this one. At first glance, this painting may seem more complicated than the previous two, but that's just because the designs are circular. This mandala painting is still based on rows of patterns – it's just that the rows are now circular, or concentric. followed by the light pink and dark pink pattern. a round row of pink and crimson dots. Do you see how when you break down a painting like this, into its individual components, something that at first looked complicated is actually quite simple? It's fun to "unravel" paintings in this way! 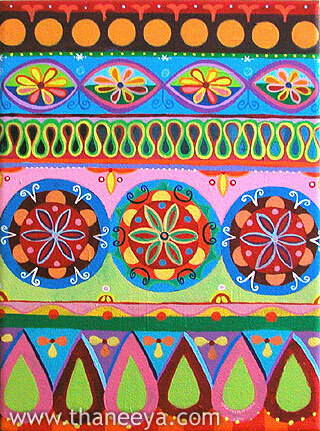 This painting is quite similar to the previous one, except there are two different mandalas, and you only see ¼ of each because each mandala is tucked into a corner. I'm sure you can easily work out the patterns in this one! 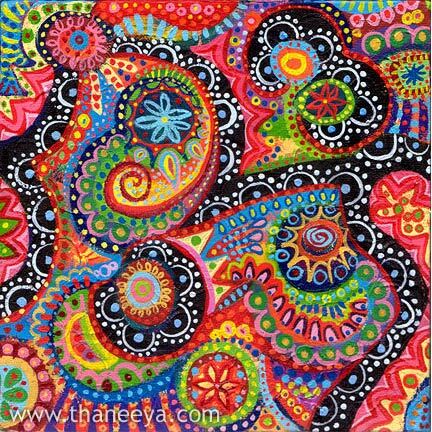 This painting differs from the previous ones because it does not contain rows of patterns - instead, the patterns are more free-flowing, looping and swirling playfully on the canvas. Can you point out the patterns in the painting above? They cover the entire canvas in their looping, swirling way. Most of the patterns involve circles, lines, bumps, waves and triangles. In the painting above, which pattern stands out the most? You'll probably agree that the black and white pattern snaking through the composition looks really bold compared to the multi-colored patterns. That's another thing to consider when making patterns in art: do you want certain patterns to stand out more than others, and if so, how can you do that? 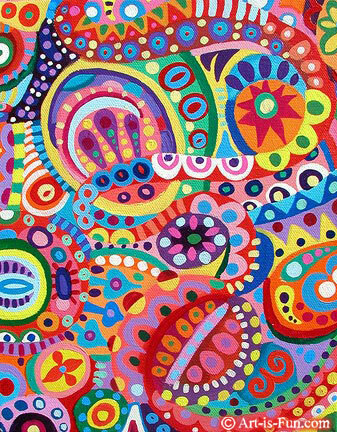 Elements like color and complexity will play a large part in which patterns in art are more eye-catching than others. The painting above contains many different patterns grouped together in a "blocky" way, almost like a quilt. The acrylic painting above is a combination of my abstract art and photorealistic art, a style which I have termed composite art or composite realism. 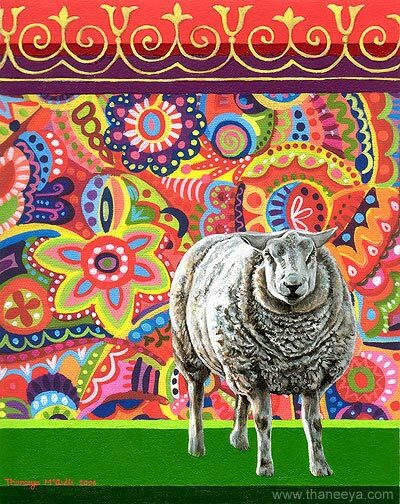 The photorealistically-painted sheep stands in front of a colorful abstract background that is filled with flowing patterns. Towards the top of the canvas, I painted a horizontal row containing an elegant yellow pattern in front of pink, crimson and violet stripes. Think about how the abstract patterns relate to the realism of the sheep. The painting above depicts a photorealistically-painted oscar fish in front of an abstract background. and the pattern of elegant designs along the bottom. The patterns at the top and bottom are more spaced out that most of the patterns I've shown you on this page, which lends them a sense of quiet charm. The white and yellow pattern in the middle is quite detailed, but since the color of the pattern (white) so closely matches the color of the background (yellow), it still has a sense of spaciousness, which really brings the oscar fish to the foreground and makes him the center of attention. Another way to use patterns in art is to make the pattern provide an area for something to stand on, like in the painting above. A small strip of green grass rests on top of a light blue area with a simple pattern along the bottom. There is a more complex pattern along the top of the painting. 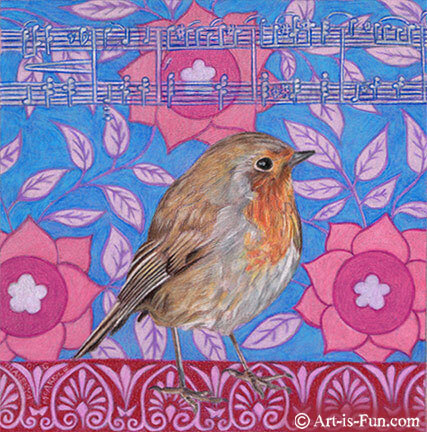 The drawing above follows a similar concept to the painting with the cow, because the robin is perched on top of an abstract pattern. The floral pattern forms the background, and the lines of musical notes at the top form another pattern. Notice the different sizes of the patterns above: the top and bottom patterns are fairly detailed, while the middle pattern, which takes up the most space, is larger and less detailed. This helps the robin stick out more in the foreground. In the drawings above and below, simple patterns form borders around the edges of each drawing. In the frog drawing above, the frog is behind the border (but some of the other objects overlap the border). In the cockatoo drawing below, the bird is in front of the border (and everything else is inside it). In each of these two drawings, there are also patterns formed by letters and numbers. 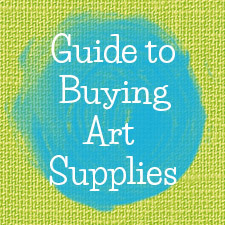 I hope this page gives you some ideas of how you can use patterns in art, from abstract art to realist art. Patterns in art can add such a strong visual interest that it's worth exploring how you can incorporate patterns into your own art! Learn how to draw patterns step by step in this easy drawing tutorial! 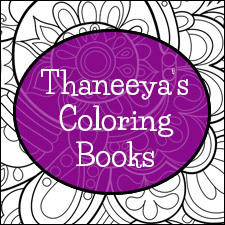 I'll show you how to draw 4 different patterns, plus tell you the secret to making up your own patterns off the top of your head. This fun and easy Henna Hand Designs art lesson shows you how to make a funky self-portrait featuring your very own hands and a wonderful array of detailed patterns - inspired by mehndi! Click here to read more about composite art – art that embraces more than one style, such as the animal paintings and drawings here that combine abstraction and photorealism.